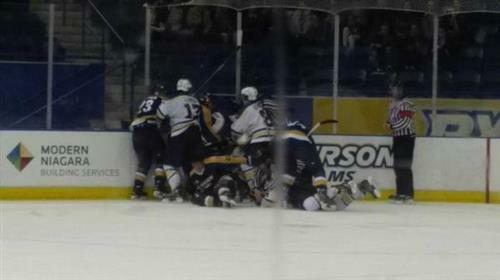 Do you want to know how the Rams men's hockey homeopener is going and can't attend the game? On October 9th follow Patrick Cwiklinski (@PatCwiklinski) and David Chen (@vidchen) for live updates during the game, starting at 7:30 p.m.
No hats were thrown on the ice for Gallant's hat trick! The MAC is packed tonight @RyersonU @MattamyAC for #LAUvsRYE. Great to see the #ramily in full force! Stay tuned for post-game videos, photos and a story on Ryersonian.ca! Have a great night!